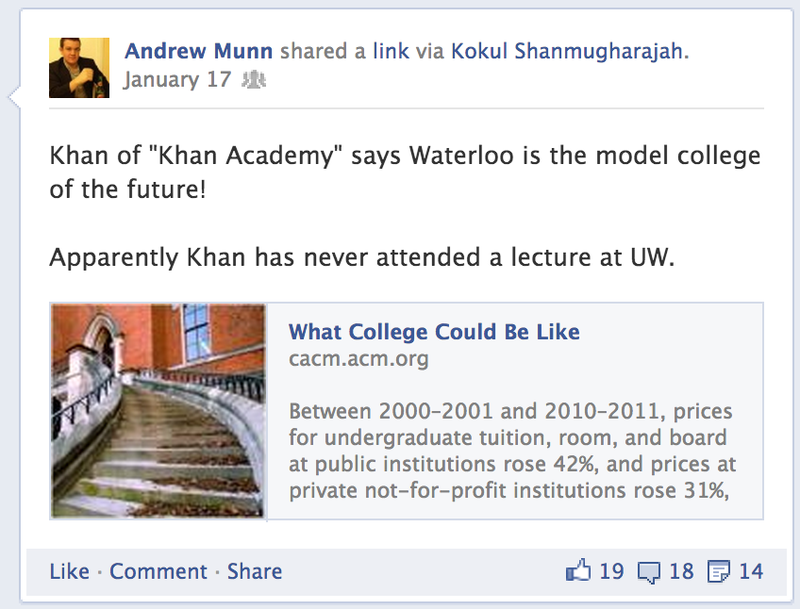 A couple weeks ago Khan from Khan's academy did a thought experiment to reinvent higher education. He concluded that University of Waterloo's education system comes close to what higher education should be like. The cornerstone of Waterloo education is the co-op system, which requires students to complete six, four-month length internships prior to graduation. Those most critical of Khan were none other than Waterloo's own students and alumni. 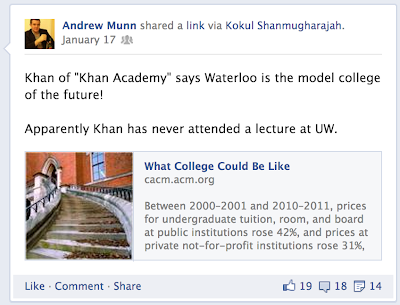 Objections ranged from a sarcastic "Apparently Khan has never attended a lecture at UW" to a more serious challenge: that the university is too focused on career development and not enough on "learning for its own sake" -- learning for the purpose of fulfillment, pleasure, and other personal purposes. Ironically, I think that the focus on career development actually puts students in a better position to learn for its own sake. It's easy to forget that historically, learning for pleasure has always been a privilege of the rich. Even with the more accessible, modern higher education, there is a tension between choosing a major that one enjoys and choosing a more useful course of study. Most undergraduate students are concerned about their ability to make a living post-graduation, and rightly so. Being able to sustain oneself is not only the responsible thing to do, but it also brings much personal fulfillment. Not many people want to end up as the waitress or barista with a liberal arts major and only the thousands of dollars of student debt to show for it. Underlying this entire discussion is the debate about what higher education should be for. Even if one believes that higher education should promote learning for its own sake, one should be realistic about student needs that come before personal development. Being able to sustain oneself is important, and if our universities ignore that, fewer people will be able to pursue higher education responsibly.